I’m rocking out some resolutions this 2017 eve. What are yours? I’d love to hear them. Let’s keep each other honest in 2017. May the words flow effortlessly from your pen or keyboard (and mine)! December was ridiculously busy. It felt like there was a Christmas morning tea or lunch on every other day. There were events to attend, catch-ups to be carried out, cards to write and send, and trees to decorate – and I still didn’t get around to honouring every social engagement. While it was in parts the Christmas season was very enjoyable it was also very rushed – I seemed to be always looking ahead to what needed doing instead of being a bit more present and enjoying the moment. Of a weekend there were markets, meet-ups with friends and family, and an ever-growing list of mundane home-related tasks that required my attention away from work and the trusty laptop. So many, in fact, I wondered if there was time for sleep during the heady four weeks of December. And then there was the heat – the unrelenting 30C-40C+ string of days that left us (pet friends included) wilting like old lettuce. Just this very evening – New Year’s Eve in fact – a thick mist has rolled in and cotton-balled our house, finally driving the temperature down a few degrees. We’re still sweating it out, but looking forward to ringing in 2017. If you’ve read this far – Happy New Year! May the next 12 months be all that you hope for (in my case that is, among other things, a lot cooler!). As for New Year’s resolutions, I’m working on a few. Remember, if rats can learn basketball, then you and I can too! I’ve been exploring the nature of curses (important research) and, as I have all year, the relationship we have with our ‘Good Neighbours’ aka faeries. My passion project has been penning a series of interlinked stories for a dark little novella that combines folklore and fantasy. Hopefully it works – my reader guinea pigs report back that they love it. I’ve also been working on developing an outline for a cosy mystery, something that has been boiling away on the rear hotplate of the stovetop that is my brain. I’ll be honest, I’m a very confident writer in the realm of non-fiction but when it comes to fiction I have always felt out of my depth. I have a major case of the ‘not good enoughs’. I think they call it imposter syndrome? Anyway, I don’t want to sound too whingey, I’ll slay my own dragons. I’ve never been a big believer in Writer’s Block, I think it should be renamed ‘Writer’s Apathy’, which is spot on the money. You can write your way through anything. Writer’s Anxiety, though, that’s another thing altogether! Initiation by Ly de Angeles (Createspace) – A ripping read. You can peruse my standalone review here. A Death to Record (A West Country Mystery) by Rebecca Tope – Talk about your twisted love triangles! I really enjoyed this mystery, which followed Detective Sergeant Den Cooper’s investigation of a murder on the farm of a man who is now dating his ex-fiance. Awkward. All of Tope’s skills and experience come to bear in this book, which leverages her insights as a former undertaker and farmer (she really should have had a stab at policing as well, but she also explores that POV quite well regardless). A riveting read. Dark Undertakings (A West Country Mystery) by Rebecca Tope – Working as a freshly minted undertaker must be challenging enough but what do you do when you suspect a death that has been judged a heart attack by a respectable doctor may, in fact, have been a poisoning? Tope loves to put her characters in difficult and often dire straits, and this novel is no different. Drew Slocombe follows his gut instinct and while investigating lays bare a string of family secrets in a small village. The holiday reading pile beckons! Can’t find time to write? Snatching at the coat-tails of the day? Me too. I start early and finish late, but there’s no writing studio like the quiet carriage in the Blue Mountains train. A couple of hours snatched at either end of the working day is better than nothing. That would be between 6.30am-8.30am and 5.30pm-7.30pm! November was action-packed. And hot! I attended the Sydney Storytellers event at the Stoneleigh Hotel, an immersive installation set up in a historic building in Kensington Street, Sydney (renamed ‘Spice Alley’, for those in the know, and bursting with tasty, colourful eateries). New Zealand-based Stoneleigh Wines was behind the venture and ensured the vino was flowing all night, complemented by a giant cheese platter. It was one of the hottest evenings I’ve spent in Sydney and there were many shiny faces as we tried to compensate for the humidity by drinking more chilled sauvignon blanc (perhaps not the wisest move, there was a slight hangover the next day). All in all, it was a brilliant night. Wine and writing, the ultimate pairing! November means Nanowrimo, but despite my best effort, I didn’t quite nail those 50,000 elusive words. I blame work. And stuff. General tiredness. Sunshine and flowers. Distractions. Food. But it was still a pretty productive time. I was still writing and progressing my urban fantasy piece. I’ve also been trialling Grammarly’s free Grammar Checker app. Occasionally it’s distracting, particularly when it tells me to change my words to American spellings (sorry American friends, for us it’s colour not color). On the whole, though, it’s a neat little tool that, I’m pleased to say, I don’t have to rely on too often – only when I type too fast and leave a litany of typos in my wake. Some great books found me in November. Superfluous Murder by Hazel Holt (Macmillan London) – I’d previously never heard of Hazel, mother of novelist Tom Holt, who wrote a series of books based around a village detective character not unlike Agatha Christie’s Miss Marple mysteries. Holt’s Sheila Malory is a slightly more modern, and younger, take on the elderly single female sleuth. The style is engaging and the twist/murderer reveal, while I picked it, would have been a pretty fresh take in 1995 when this was first published. I found this book up at my local train station book exchange for free, so I’ll be chasing up Holt’s other books online. The Three Miss Allens by Victoria Purman (Harlequin Mira) – This is a story that spans generations and families with plenty of romance and history, not to mention a mystery! (Some unintentional rhyming going on there.) The book is set in one of my favourite time periods, the 1930s, and follows Roma Harris in the present-day as she moves to the small town of Remarkable Bay in South Australia. Roma runs into her distant cousin Addy who, like her, is bunkering down and taking time out from life. When the pair discover an old guest book with a family name they don’t recognise, they set out to solve a family mystery. Wayward Pines trilogy by Blake Crouch (Thomas & Mercer) – It’s hard to convey just how much I enjoyed this series. As thrillers go, it certainly was a heart-pounding read. I actually had to put one of the books down as I was reading it in bed and knew with my heart rate skyrocketing the way it was, I’d never go to sleep! I devoured the books in the space of 10 days, fitting in readings on train journeys and before bed. I’d recommend writers seeking to improve their pacing and sense of suspense use these books as a template for manipulating the blood pressure of readers. Now I’m hunting down the new Wayward Pines Fox adaptation starring Matt Dillon and directed by M. Night Shyamalan. Sometimes real life intrudes in unexpected ways, and the best laid plans…well, they just don’t happen. That was the second half of 2015 for me! A house move, job change and hosting the annual family Christmas gathering pretty much cruelled all of my creative ambitions. I couldn’t see my way straight to settle down and meet my own writing deadlines when there were rooms to paint, boxes to unpack, and a menu to organise. And now it’s 2016, and the year is already well and truly advanced – it’s March already, Summer in the southern hemisphere is leaving us in a fiery, defiant blast with a string of days of 30C+ temps, while the shops try and sell us new Winter coats before we’ve even put away our swimmers. One thing I have managed to do this year is settle in for a chat with the wonderful Sophie Masson (pictured), who approached me to talk about The Alliance of Independent Authors and my role as a regional representative. I never quite worked up the nerve to actually tell Sophie I’m a big fan of her writing (I read Clementine and The Green Prince many, many years ago and loved them dearly). Since then she has published quite a few books spanning various genres, and been pretty busy behind the scenes as well participating in various publishing groups. And here’s something I didn’t know about one of my favourite authors – she has been dipping her toe into the waters of digital publishing with an exciting new venture, Sixteen Press, her own e-publishing platform. Anyway, to hear more about ALLi in Australia, and author-publishing in general, hop on over to Sophie’s excellent and charmingly named blog Feathers of the Firebird. This weekend while everyone else has been looking for chocolate eggs in the tall grass, I have been busy trying to weave together stories for two anthologies I’m editing. I have always enjoyed reading, and there’s something rather special about pulling together the work of other writers in relation to a particular theme. Specifically, I’ve been tinkering with the adrenalin-pumping non-fiction tome Call of the Wild, and my creepy M.R. James tribute anthology of short stories, both of which have attracted some very high calibre offerings from both new and established writers. And while my house has (rather unthinkably) been caffeine and chocolate-free, there have been bunnies aplenty – wild brown rabbits darting across in front of our car when we nipped out for a Saturday drive (no mean feat on the Easter long weekend when my neck of the woods becomes choked with cars heading east and west). After the rabbits zipped by (egg-less, they must have already done the bidding of the Easter Bunny), I noticed we had stopped out the front of an old miner’s cottage, and the road had turned into a dirt track. 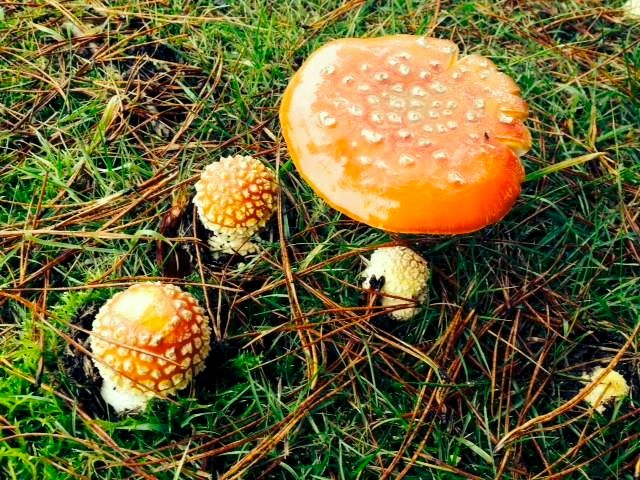 In front was a magnificent old pine tree, and gathered around its roots like a colourful skirt were lots of Amanita muscaria, pretty red and white toadstools of the kind always seen decorating faerie bowers. Sometimes the magic happens when you least expect it.